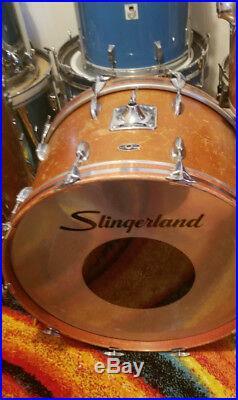 Slingerland 1970’s mahogany finish with a 24″ bass drum 15″ ride tom 18 floor tom. 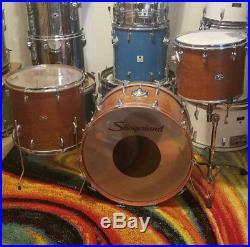 A rare drum set with sizes 15″ ride is a concert tom 18″ floor tom with four legs and a 24 bass drum. There are lots of scratches on the finish of all the drums less on the floor tom. The interiors are Maple and clean. The bearing edges look very good. Missing tom mount L arm. Please note the tom stand is not included. Please ask questions and look at pics. S/N # 408859, 408872, 408857 Thank you. The item “Vintage Slingerland drum set 3 pc” is in sale since Friday, November 30, 2018. This item is in the category “Musical Instruments & Gear\Percussion\Drums\Sets & Kits”. The seller is “duckie2121″ and is located in Glendale, Arizona. This item can be shipped to United States.